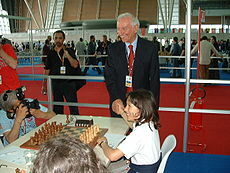 Piero Angela shakes hands with 12 year-old Marina Brunello at the Turin 2006 chess olympiad. Piero Angela, Grand Officer OMRI (born 22 December 1928) is an Italian television host, science journalist, writer, pianist. Angela was born in Turin, the son of Carlo Angela, an anti-fascist doctor. After literary studies and a period as amateur jazz pianist, in 1952 Angela entered the Italian State Radio Company (RAI, then still known as EIAR) as a journalist. When television was introduced in Italy, in 1954, he became part of the staff of the only news broadcasting team existing in Italy, as a correspondent from Paris and then from Bruxelles. Later, together with Andrea Barbato, he was host of the Rai 1 morning news and, from 1976, the first host of news on the new state channel, Rai 2. From 1968, Angela directed a series of science documentaries (including one about Apollo program). Starting from 1971 he hosted, for Rai 1, a series of scientific TV programs about astronomy, biology, global economy, parapsychology and others. In 1981 he started his most famous show, Quark which, as per 2018, is still active although in different forms. Quark was hosted weekly until 1983, and spawned a large number of specials and spin-offs dedicated to several scientific topics, from dinosaurs to human biology, from history to anthropology, from astronomy and cosmology to economy. In 1995 Quark was succeeded by SuperQuark, lasting two hours instead of one. Starting from 2000, Piero Angela and his son Alberto introduced Ulisse, a monographic show dedicated to human history and discoveries. Angela has also written a large number of popular books, starting with L'uomo e la marionetta in 1972. Some were in collaboration with his son Alberto. In 1989 Angela was one of the founders of CICAP, a scientific committee devoted to verification of allegedly scientific disciplines such as parapsychology. In 1996 the Committee for Skeptical Inquiry (CSICOP) presented Angela with the Responsibility in Journalism Award. Wikimedia Commons has media related to Piero Angela. All the following programs have been broadcast by Rai Uno. ^ Information, Reed Business (1986-10-16). New Scientist. Reed Business Information. pp. 61–. Retrieved 1 August 2012. ^ "CSICOP Award Winners". Skeptical Inquirer. 20 (5): 7. 1996. This page was last edited on 15 November 2018, at 14:37 (UTC).